If Lorde’s debut album “Pure Heroine” is about her ambivalence of entering a brave new world, then summer release “Melodrama” documents how she’s trying to survive from the inside looking out. This, her first night of her world tour, proves that she’s doing just fine. In an era of modern pop music saturated with one-upmanship and self-awareness, Lorde refreshingly stands alone, the media-appointed ambassador of dark-pop despite only being 20 years of age. It was Georgia R&B singer Khalid who opened the evening to an already capacity crowd. He has been shrouded in hype ever since the release of his debut mega-hit “Location”, and bagging a support slot tonight is proof of hype matching the success. It’s clear from the off that, like Lorde, Khalid is not your archetypal youngster, and although influences such as Frank Ocean are quite clear (he did cover Frank on Radio 1 recently after all), his blend of cross-over R&B and pop looks set to propel him to stardom and perhaps return to similar venues to this old theatre for his own headline tour very soon. The stage sports just three musicians hidden in darkness, a vintage TV screen, and neon lighting that wouldn’t look out of place on the West End. This gives Lorde a huge amount of space which she adopts with ease, skittishly racing across the stage and thrusting her brunette locks at the crowd in joyous abandon. The whole set is engineered to perfection; what might be intimate and personal on record is brought to life, with beats hitting a little harder, and filtered synths hypnotically pulsing and swelling. 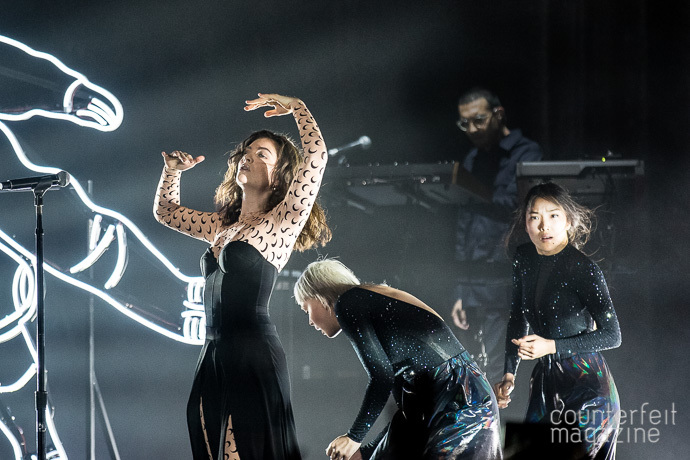 There’s a balanced mix of tracks from both of Lorde’s albums, and “Tennis Courts” arrives early in the night, each line punctuated with a pitched-down “Yeah!”, echoed by the crowd. “Buzzcut Season” begins with Lorde on her knees, playing the intro notes on a toy glockenspiel, before making way for a beat-driven tale of privilege in a war-torn world. Not that this puts a downer on proceedings; Lorde and her band have a knack of funnelling every inch of energy towards the affectionate crowd who hang on every note. 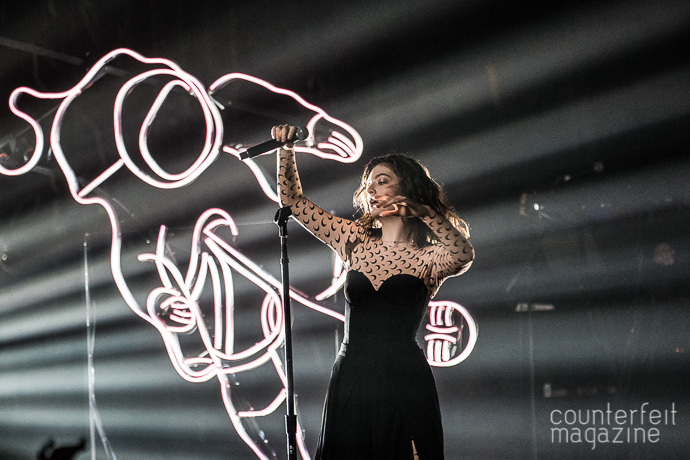 Speaking over the chords of “Melodrama” piano-ballad ‘Liability’, Lorde tells the story of the evening her and song-writing partner Jack Antonoff penned the song’s hook, and knew there and then that it would one day be sung back to her by her fans. Sure enough, the emotion drips from every word; “I’m a liability / Get you wild, make you leave / I’m a little much for everyone”, which leaves everyone a little teary-eyed. 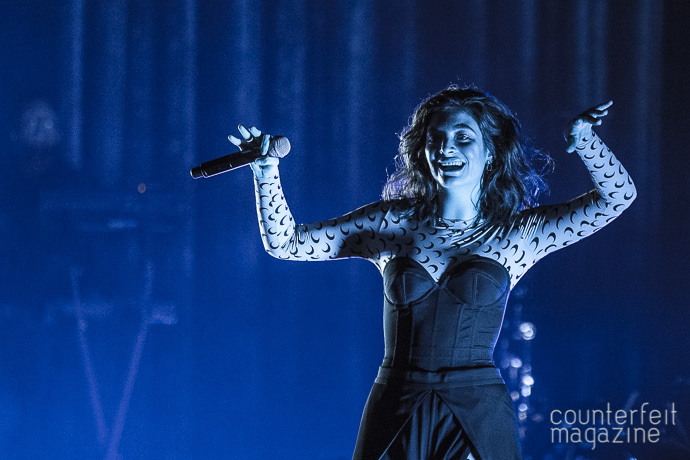 In between songs, Lorde often takes a step back to try and soak up the reception that echoes around the O2 Apollo. She regularly giggles humbly as the crowd’s screams amplify, not quite realising that this is the adoration that she deserves. 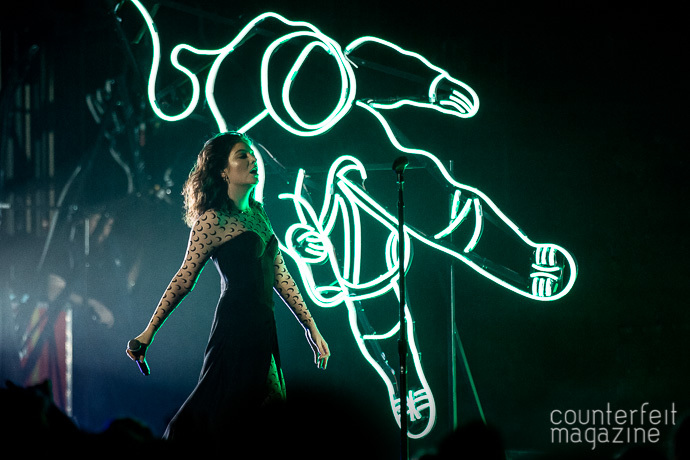 Whilst most touring acts come to Manchester and speak of how they grew up listening to The Smiths, or New Order, Lorde comically gushes over Coronation Street. She does however pay homage to London’s Phil Collins in the form of a faithful cover of “In the Air Tonight”, complete with iconic drum fill. Sometimes you have to remind yourself that she’d be too young to remember the turn of the millennium, yet Lorde can write such mature words as those in ‘The Louvre’ and earworms like main set closer ‘Green Light’. It’s the latter where the night’s energy peaks as the crowd jumps in unison to the track’s euphoric hook, encouraged by an explosion of confetti and flashing – you guessed it – green lights. Lorde returns to the stage alone with a sampler for one more song; the second half of “Hard Feelings/Loveless”; a strange choice, especially with new album hit “Homemade Dynamite” being absent, but by now it’s already apparent that Lorde doesn’t play by anyone’s rules.